Well, my friends, I'm in Miami right now. I'll be visiting all the gondolas in the area , and then off to Naples, Florida to tend to other gondola business. I must say that this part of the country is hard to drive around. You see, I'm a gondola fanatic. I'm obsessed with gondolas...and waterways. Here's the problem: any true gondola fanatic has a knee-jerk reaction upon seeing a waterway. The automatic response is the thought - "hey, I'd love to row a gondola there". Well, as I drive around Miami, Ft. Lauderdale and other parts of Florida, I'm constantly encountering canals - they're everywhere! So I'll see a canal, "ooh" and "ahh" about it, and then almost run into the back end of a car being driven quite slowly by a senior citizen (which they also have a heck of a lot of here). It's a problem. So my treat today, in honor of my visit to the Sunshine State, comes in the form of two postcards from the area. The first one is postmarked 1944, and features a nice image of a gondola, in a fairly wide waterway, with a palm branch arching over the boat from a tree in the foreground. It's an image with really great composition, and I believe it was originally a photo that was colorized and retouched. 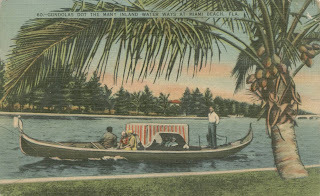 The text across the top of the card reads "Gondolas dot the many inland water ways at Miami Beach, Fla". The next postcard has no postmark, and therefore no date. 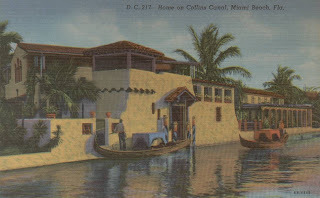 It simply reads "Home on Collins Canal, Miami Beach, Fla". After some inspection and comparison, I believe that the boats in both cards were different vessels, but modified in the same manner. The above image features a boat that looks to be a standard Venice-built gondola, while the two below appear to be shorter in length. Take a good look and you'll see some similarities; first there's the canopies, and then there's the steering and propulsion. None of the gondoliers appear to be rowing. They look like they're steering with a small tiller-type handle in a manner quite similar to some of the motorized boats in California and Australia. With the splash coming off the front of the gondola in the above image, I wonder if we are seeing one of the earliest motorized gondolas. While I'm here, I'll ask around but I don't know if I'll get any information. A lot of details can be lost in sixty years. It was great to talk to you today and as often times my phone died due to lengthy conversation. :-) I decided to post as I was saddened that there were no previous entries and I love being first. I really enjoyed reading your blog and think that it is a great tool for information, ideas and trends. I also love seeing the other gondolas as well as learning more about other operations. We lauch our boats May 1st here in Virginia Beach as our 2nd season gets underway. I will send pics. My very best to you, Elisa and the girls.